We left Brno with inside excitement on our mind on Saturday evening & straight headed south through Slovakia and Hungary. Along the way, some of our colleagues spent a certain time drinking of their favorite alcoholic beverages, which brought to a bus group interesting amusement & witty issues. We came across with the only one significant delay at the border of Bosnia & Herzegovina as unfortunately we were not aware of the new regulation settled for the bus operation. 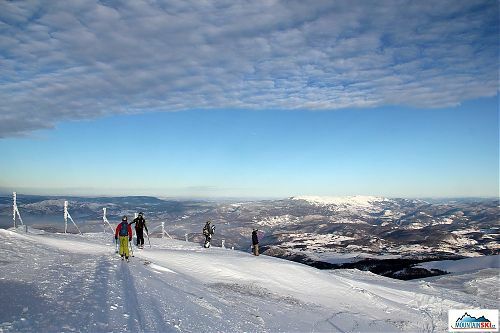 Everything has been smoothly managed and we reached the ski resort Bjelasnica on Sunday morning. 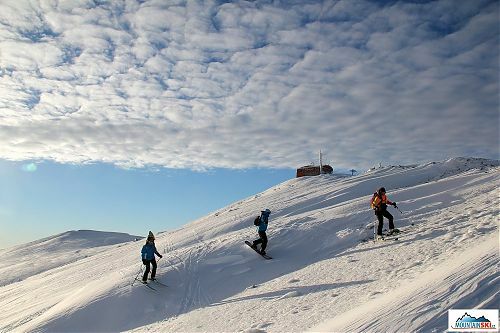 Most of the participants decided to go for skiing. The rest of the group preferred prompt acclimatization at local bars & restaurants. There was a thick fog in the upper part of mountain Bjelasnica. 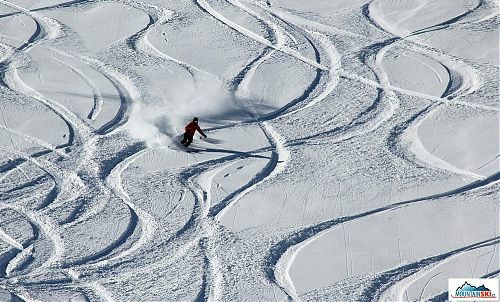 It did not matter to us at all as there was a plenty of powder in the forests as well as on the untreated slopes. In the group of four ski dancers we were going extremely downhill and singing „powder, powder“ even if the actual visibility was not awesome as expected. 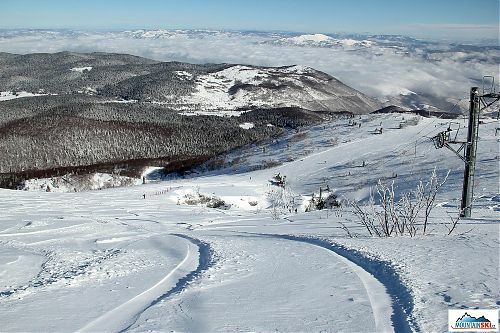 Hence our skiing was over that day we moved to Sarajevo & met our accomodation needs in the centre of the city. Afterwards we gently celebrated our Ski welcome party at local brewery restaurant and went relatively early to bed. Sunday night was determined by heavy overnight snowfall however Monday morning Feb 4th, was “georgeous” day for “georgeous” powder skiing. First of all we did ski in the lower part of the ski resort. 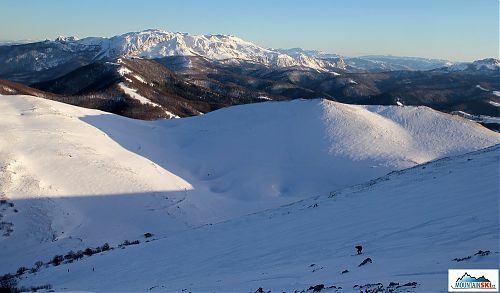 As soon as the main poma lift (leading up to the main ridge) was turned on, we immediately started going uphill. Unfortunately morning local skiers were faster than us, so there were not available slopes without at least one downhill track. That did not bother us at all and we took a credit for other tracks. 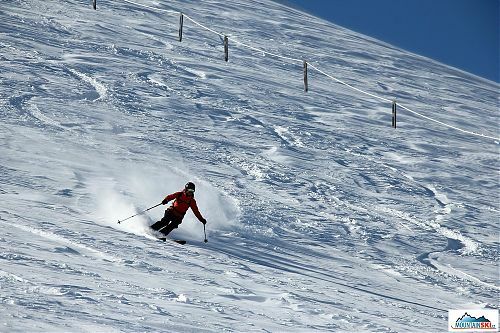 Later there was a small group of skiers going freeride downhill from the sunny peak. Compared to Bjelasnica trips in previous years, locale strong winds & changeable weather made this place beautiful deep snow most of the descent to the saddle after an ice mountain. Each one could have a short time to try different kinds of snow, which, after the powder rozmlsání little fighting on ice. In the afternoon we encountered our two bosnian colleagues on the slope and they continued with us to the main mountain ridge. Together we aimed (on ski & walk) around large rock boiler to amazing snowy slopes. Expected top of a downhill was fantastic and unlimited. There was a smaller crop below and the way back to the ski resort was ended by forest traverses and gentle descents. 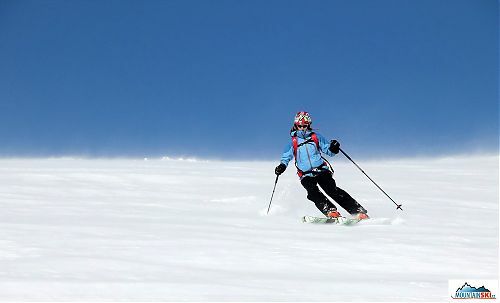 Our next try was aimed to the main mountain ridge and we went for around downhill skiing through the saddle. Even though we got closer to our ski resort, an icy mountain surface was worse on the top. On the contrary lower and lower downhill we went for skiing with the direction on straight to the saddle, it was quite unbelievable. From the saddle we kept going down into the valley and moved back to Sarajevo. There was free time schedule for each participant with confirmed details about our morning leaving as weather forecast was estimated as very good. 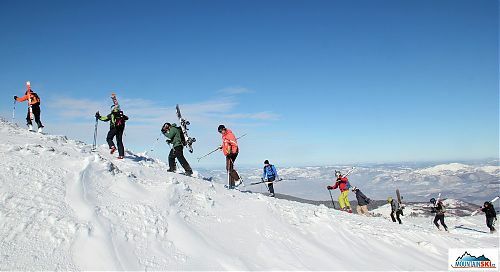 On 5th Feb 2013 we arrived at our ski resort Jahorina around 9 am. There was changeable weather in the top part of the mountain however local snow was fresh again. 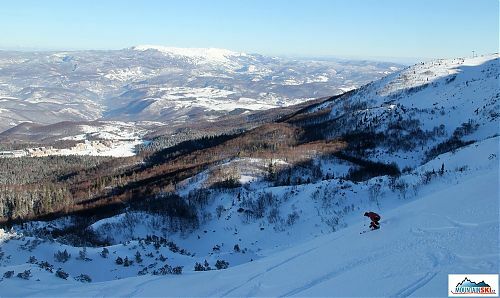 During the second race (in group of three) we did skiing through wooded rocky slope well liked in previous trip in 2012 – Skiing and alpine skiing in Bosnia & Herzegovina with s Nabosem a Hedvábnou stezkou – February 2012. The approach into glen was little overgrown than last year however the downhill itself was incredible. 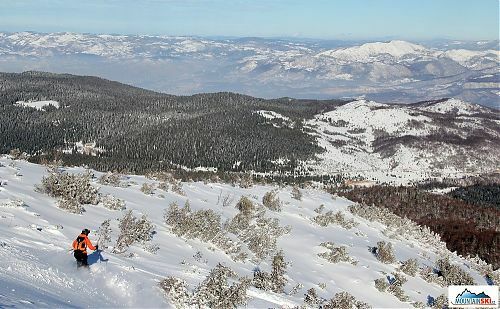 The rest of the day was devoted to an enthusiastic freeride skiing out of the slopes however all downhills were ended at the bottom of the slopes. There was a similar situation in coming days as well. There were sunny days and foggy ones following all our trip staying at ski resort Jahorina. We also had chance to try the upper disheveled part of the Olympic ski downhill & many other interesting places around. 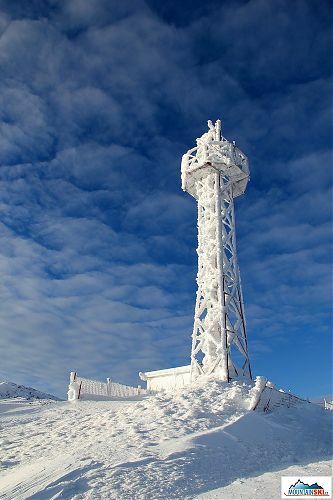 In the meanwhile we also did some night skialpinist climbs to the frozen transmitter at the top of the ridge. Our headlamps were the only one light way on our subsequent ski downhill (more precisely I have used no headlamp). 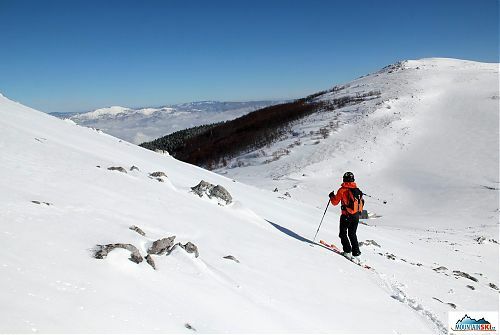 There was one day also devoted to the basics of avalanche training, survey of snow stability and basic avalanche tests, for approximately half of participants of ski trip at Bosnia & Herzegovina. On Friday 8th Feb 2013 there was a dense fog on top so we decided to explore the lower part of black slope. We wanted to go with Ondra steep downhill from the top of ski lift station however we were stopped to do that by present lift security man. We have no other choice than to move a little bit further from the lift and fill out our desire. 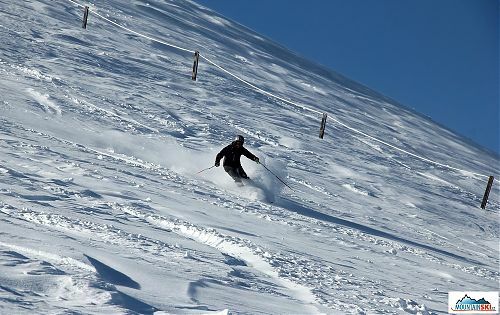 Hence we jumped into following steep snow glen there was a fresh powder glacier tongue touching our moving skis. There was our last day in Bosnia on Saturday 9th Feb 2013. 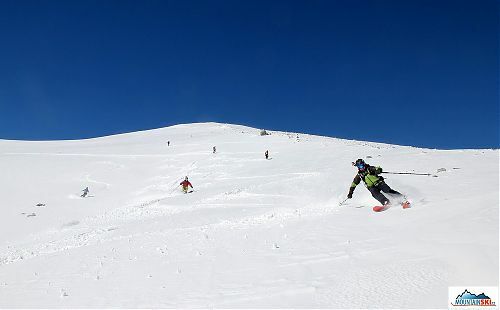 One part of the participants used their skialpinist equipment and claimed up to foggy hill and second part of the group devoted their time to fresh powder skiing even if the natural visibility was approaching zero meters. 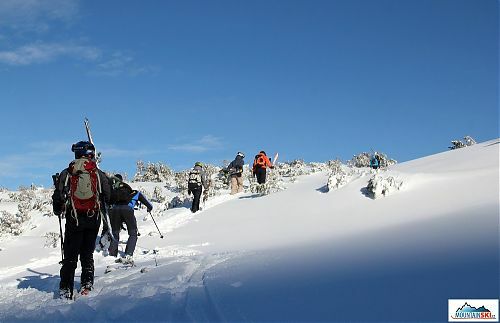 In terms of snow & terrain, we have to say that our ski week trip was greatly succeeded. 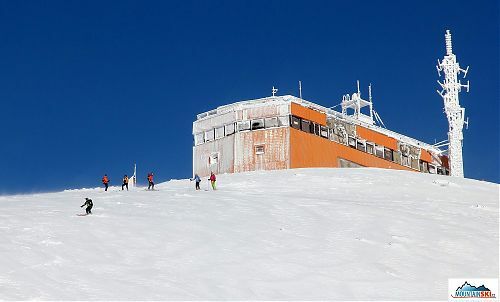 There was only one minor question mark regarding a number of beautiful days and that Bjelasnica´s icy mountain side of the ridge. Next time it might work as well or even better.